Mike from the Eclipse Foundation wrote a great post on the next thing we're doing around driving Java EE forward: the EE.next Working Group. There isn't really a lot more that I want to say which isn't covered in Mike's article and the point of my post is more to try to encourage everyone to get involved, whether you are representing a corporation, big or small, or just acting as an individual. I've said it before but I'll say it again: the future of Java EE will be determined by the community and you can help in many different ways. Start by joining the working group! I've written about EE4J a few times before and many others have too, particularly on the name. Back in November, Mike from Eclipse announced that we were going to run a community effort to pick a new name for the Java EE brand once it moves to the Eclipse Foundation. We had a lot of great names submitted from the community by the time the input period ended. The next step was to run through various legal, patent and IP processes to determine whether each name was even open for use. Very similar to the processes we had to go through when we renamed JBoss AS7 to WildFly, in fact. That pruned the list dramatically to the point where we now have only a couple of names left as options. Yes of course we could re-open the suggestion box but that's not going to guarantee a different outcome and in the meantime the Java EE brand doesn't move forward. Therefore, that's why as a member of the EE4J PMC I agree with the original timeline of events and we should simply vote on the two renaming names: Jakarta EE and Enterprise Profile. Jakarta is the largest city on the island of Java - 'nuff said! I know I said the fact it's a city on the island of Java was enough, but if you go and do some research, or especially you live in the area, you'll see that the city is thriving and driving innovation, growth etc. in the region, which are similar things to what we wish to accomplish with EE4J. 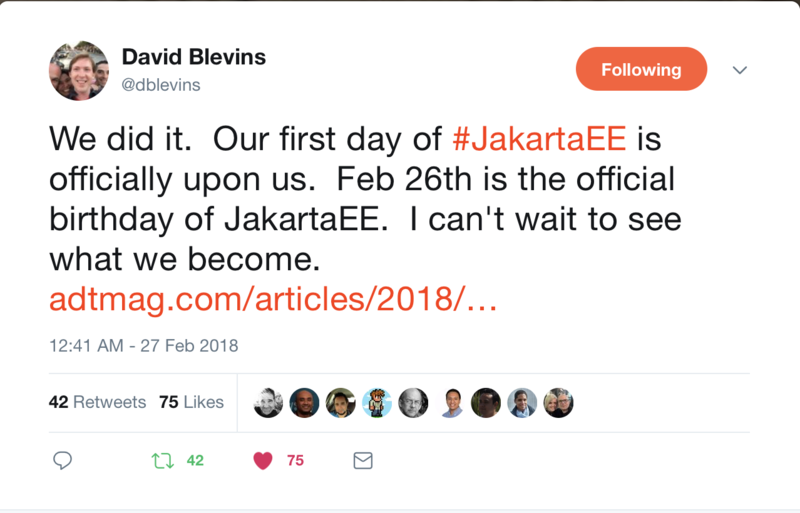 So all in all I think Jakarta EE is by far the best choice of the two. And in fact I can't think of a better name now that we've whittled down the list. However, this is a community effort so just remember to cast your vote.